Even a prestige cast and whiz-bang machinations cannot save Vantage Point, the, oh, thousandth resurrection of Rashomon, this time as a 24-inspired deconstruction of the apparent assassination of the U.S. president (William Hurt), on the eve of an international counterterrorism summit, from six different perspectives. The problem is that by the third or fourth rewind/replay, revelation turns to repetition. The tableau ultimately proves a hollow gimmick designed to stretch the film’s running time to the requisite 90-minute mark. By the time you realize that you could just watch the overextended final segment and glean the entire plotline, you have already sat through 70 minutes of filler with nothing to show for it besides a bad case of déjà vu. The round-robin format leaves several actors – particularly CNN-style press hounds played by Sigourney Weaver and Zoe Saldana – with little to contribute while relegating others to their base impulses. 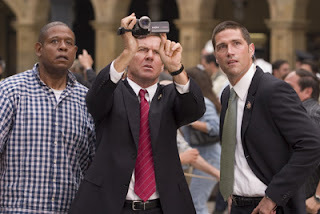 Chief among the latter are veteran Secret Service agent Thomas Barnes (Dennis Quaid), who once took a bullet for the president and spends this entire film sporting Quaid’s trademark scowl while constantly staring into a video monitor and growling some variation of “My God…” or “Jesus Christ…” As an American tourist with a camcorder, Forest Whitaker manages to over-Method a role that requires little of him besides running through the city streets of Salamanca, Spain filming his own personal Cloverfield. Hurt and Lost's Matthew Fox acquit themselves well; in particular, Fox’s brand of intense masculine vulnerability gives him star potential that can be realized in the right role. But, so absorbed are director Pete Travis and debut screenwriter Barry Levy in their fastitious formula that before all the disparate narratives conveniently collide at a single intersection in the middle of town, they attempt to package zeitgeist about overseas anti-American sentiment and the nobility of a president who refuses to reflexively bomb a friendly Arab country based on “solid intelligence” inside a storyline that features unfriendly Arab jihadists killing hundreds in an effort to off that same president. An improbable car chase, a POTUS body-double, and the interminable plight of a lost little girl are the frosting on this bland layer cake. The most useful vantage point, it turns out, is the view of the theater’s exit door on your way out of it.